This swap is for 3 full sticker sheets. 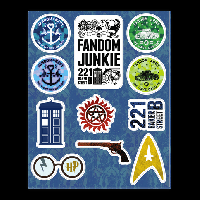 These need to be full sticker sheets. no cutting of the sheets. You will have 3 partners to send to. This is senders choice, please make sure that you have provided at-least 3 different sticker sheets. If you receive 3 sticker sheets please rate a 5, if you really like your stickers feel free to give a heart. Please no reward or alphabet stickers, unless requested on partners profile. Also no kiddie stickers such as spiderman, dora, diego, princess, frozen, etc. No planner stickers unless requested. Please only send stickers you would like to receive. Newbies welcome with a full detailed profile. I make my own sticker sheets...can I use those? How many per page? @ChristieAnn566 you can contact your partners would assigned and ask each one, but I would say personally I would only want store bought sheets.